One quick look at the demographics of the construction industry, and you can see how important planning is: the average age of construction workers in the US is 43; in the UK, 700,000 additional construction workers are needed over the next five years to meet the government’s objective of 1 million homes, according to the Farmer report . No commentary on the subject of talent would be complete without some reference to the different priorities of Generations Y and Z. Today’s young talents look beyond salary packages and benefits, and emphasize flexibility (“own your time”), purpose and ethics . Many companies in the tech sector and others have already adapted their recruitment and retention schemes to reflect those new priorities; construction companies need to up their game if they are to compete in the quest for talent. A millennial might well be attracted by the opportunity to help transform a millennia-old industry – but only if he or she feels that the company is genuinely embracing the change. 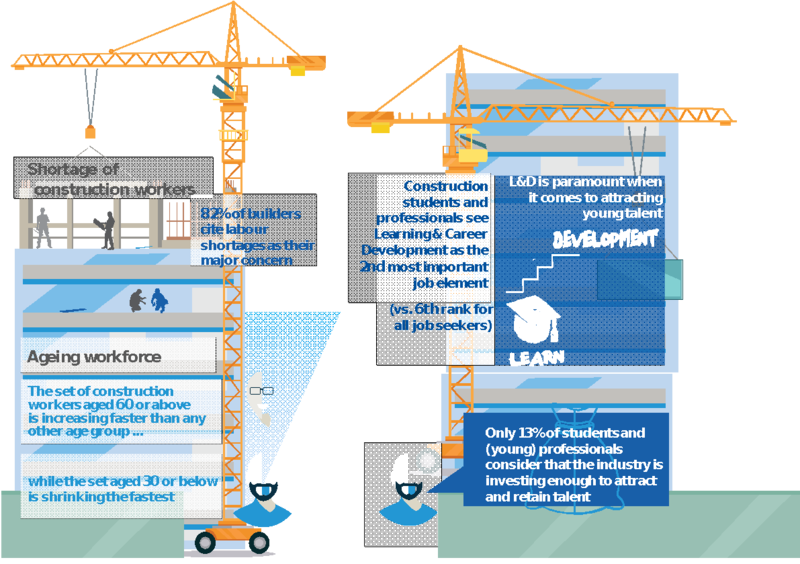 Collaboration with external organizations is likewise crucial – with universities, for instance, in providing continuous L&D of construction professionals and in tailoring curricula to the future needs of the industry. One striking example, leveraging the new format of Massive Open Online Courses (MOOCs), is Columbia University’s Construction Project Management and Planning Specialization , which brings together 20 industry leaders from different companies.